From a total of 39,324 inspections last year, the Occupational Safety and Health Administration (OSHA) found 88,846 violations. For warehousers, distributors and manufacturers, the list is familiar. Just ask Cintas…it can get expensive not to comply — directly and indirectly. OSHA levied a $196,000 fine against Cintas Corp.’s Mobile, Ala., facility for 15 safety violations, including conveyor, machine guarding, electrical, & fall protection, among other things. But that’s just the direct costs. The indirect costs of an unsafe operation are lots higher. Add in workers comp, injuries, litigation, inefficiency and operational disruption, and you build a strong case for erring on the side of safety, even at the cost of short term expense. For heavy users of warehouse equipment like conveyor, pallet rack, lift trucks and other equipment, the list isn’t surprising. Lift trucks are inherently the most dangerous thing in any facility that uses them. Besides being #6 on the 2007 list, the severity of the kinds of accidents they can produce make training, process, and shielding paramount. One of the things we have always maintained is that with lift trucks, fewer is better. Besides costing less to operate, the fewer trucks you have fewer chances for accidents there are. You also can train fewer, better drivers and focus on keeping them at their best. You can also lessen the need for lift trucks through smart facility layout, conveyorization of certain processes, and other measures, but most operations will need them. Doing things that lessen the dangers seem to be a no-brainer. 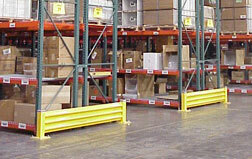 We recommend using solid guard rails to segment pedestrian and lift truck aisles, mounting column protectors on racks to prevent lift trucks from hitting them, and using fall protection systems like safety netting or wire mesh guards to prevent a rack collision from causing loads from falling off the racks.